The restoration is a story in itself, employing the collaborative efforts not only of Mr. Murch, but the Library of Congress, the Edison National Historic Site, the incredible sonic restoration capabilities of the Rogers and Hammerstein Archive of Recorded Sound at Lincoln Center, and Skywalker Sound and Industrial Light & Magic. Most strikingly, the archive was able to repair and re-record the broken cylinder, while Murch managed to perfectly sync the sound with the video. Edison’s experiment worked, only just over a century later than anticipated. 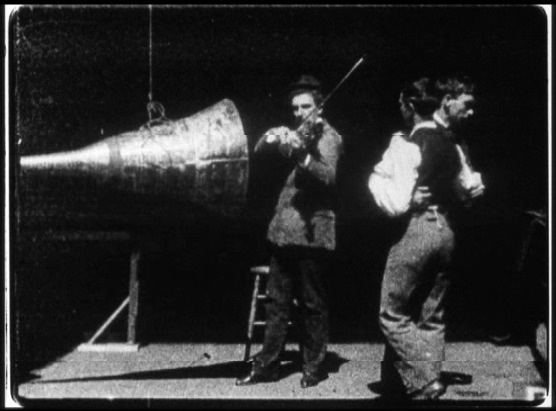 The film itself is a surreal dance with violin accompaniment, dwarfed by the giant cone used for recording. Since Mr. Murch and Sean Cullen donated the film to the Internet Archive, it’s also Creative Commons-licensed, meaning you can create your own audiovisual experiments with the footage. I expect the fully remixed version in my inbox within the week. A playback note: the MPEG2 I downloaded didn’t properly reproduce sound in QuickTime 7, ironically enough. In the open source MPlayer (Mac; also on Linux and VLC (cross-platform) players, I had no trouble.